The following reports, published recently, offer some insight into giving trends, including e-Giving and Peer-to-Peer Event Fundraising. Drawing on data from both Canada Helps and the Mobile Giving Foundation, the report provides a comprehensive profile of trends and implications. "As a added feature, her analysis draws on the International Classification of Nonprofit Organizations to establish a baseline for potential comparisons across countries." You can access a PDF of e-Giving in Canada: Donation Trends in the 21st Century - here. Convio (provider of on-demand constituent engagement solutions for non-profits) recently published a report on Peer-to-peer fundraising events such as walks, races and rides. They note that these events – which rely on supporters to register for, participate in, and fundraise on behalf of the organization – have become a staple for some nonprofit fundraisers, often bringing in more revenue than any other fundraising campaign throughout the year. Based on research of 48 different nonprofit organizations (using Convio TeamRaiser™) and more than 1,800 fundraising events in the United States and Canada, the Convio report outlines how to measure the success of such fundraising events, and offers industry benchmarks. In 2010, traditional peer-to-peer fundraising events (run, walk, and ride events) continued to see growth in both online participation and online fundraising, despite an uncertain U.S. economy and growing saturation of the market. In traditional events, team participants continue to out-perform individual participants, with team captains performing best of all. In traditional events, participants who registered online for the prior year’s event and returned to register online again for the current year’s event were more likely to fundraise, and fundraised more than those who did not participate online the prior year. The number of emails sent by a participant directly correlates to number of donations they raise. On average, a participant will need to send out five emails to recruit one donation. As more organizations provide integrated tools for sharing and fundraising on social networks, fewer emails are being sent by participants to prospective donors. 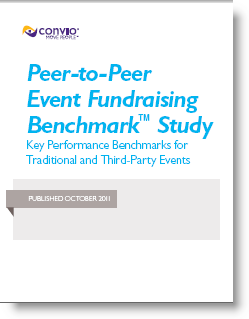 You can download the Peer-to-Peer Event Fundraising Benchmark TMStudy at: www.convio.com/p2pfundraising. Thanks for the additional information Cheryl.